Democrats Work: Yes We Cans! Across the country, food banks are struggling to keep up with increased demand. And with the holidays approaching, Democrats Work is doing something about it. We need your help. Today, we are launching the Yes We Cans Virtual Food Drive to help you donate to the food bank in your community. In Oklahoma we are helping the Tulsa Community Food Bank, and the Regional Food Bank of Oklahoma. 1. Click here to go to our Yes We Cans Virtual Food Drive website. 2. Put food or cash contributions in your shopping cart. 3. 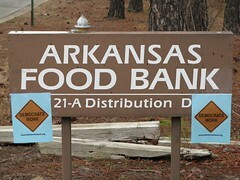 When you check out, you will be able to designate one of over 200 food banks that will receive your donation. No matter where you live, you can give to a food bank in your area. Put turkey on the table in Colorado or fill a child’s bowl with mac and cheese in Atlanta. Together, by making donations through Yes We Cans, we are giving food banks the power to buy in bulk and provide more food than each of us could donate individually. This election was about bringing positive change to our country. We don’t have to wait for others to act: we can make a difference in our communities year-round. Thanks to you, we are putting our values into action when they are needed the most. Also! — If you want to volunteer or deliver goods directly to your local food bank, you can find the location of one near you by visiting Feeding America. And please send an email to info@democratswork.org so we can keep track of what the Democrats Work community is contributing this holiday season. and big thanks for helping those in need. Yes We Cans has gotten an incredible reception; its been truly inspiring.